Google has moved its dedicated 64-bit Windows build of Chrome one step closer to its final release with the launch of Google Chrome 37.0 Beta (64-bit). The new release requires Windows 7 64-bit or later to run. The new build, which is also available in 64-bit form for Linux, moves to the beta channel, but despite media speculation, users should not assume a final release is just a few weeks away – it could yet be months before Google deems the build is stable enough for general consumption. The new build, which is not compatible with 64-bit versions of XP or Vista, can be installed over the top of an existing Chrome installation -- users should find their settings and bookmarks are preserved. On the surface, little should change for those switching to the new build -- while the move to 64-bit should, in theory, open up more than 3GB RAM for Chrome users, it’s worth noting that each open tab is given its own separate process. This means that the 32-bit build already allows up to 3-4GB RAM per open tab, which is more than ample for most people’s current browsing needs. In fact, the switch to 64-bit puts users at risk of allowing individual Chrome tabs to gobble up more available RAM should memory leaks occur, affecting overall performance as a result. However, switching to 64-bit architecture isn’t simply memory related; it also opens up Chrome to benefit from more general 64-bit performance improvements, while it can also be seen to represent a move to future-proof the browser. Users should also be aware of question marks over compatibility with existing plug-ins, some of which may need to be upgraded. One notable example is that the Google Talk plugin doesn’t work with Chrome 64-bit; however, the plugin should become redundant when Chrome 38 reaches the beta channel. That’s because version 38 -- currently in the Dev channel -- adds a built-in WebRTC component that allows Google Talk to function without the need for a separate plugin. Other compatibility considerations include the need to install a 64-bit version of Java. Google Chrome 37.0 Beta (64-bit) is available now as a free download for PCs running 64-bit versions of Windows 7, 8 or Linux. 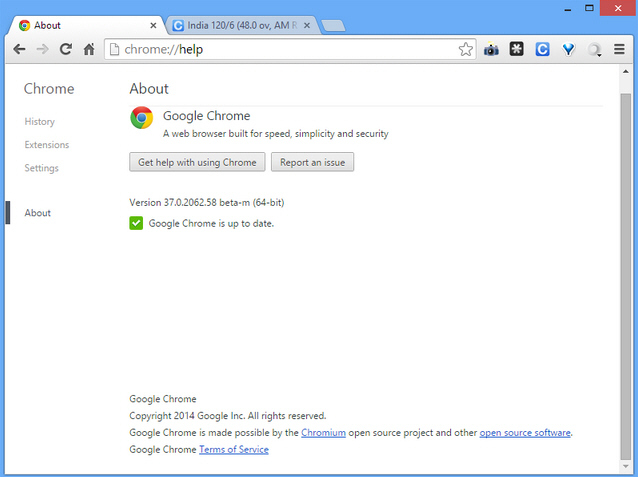 Also available for Windows, Linux and Mac is Google Chrome 37.0 Beta (32-bit).